Admiral Allen, who is the Government head of the effort to cap the flowing well in the Gulf, and to oversee the cleanup operation, commented this morning that the well had reached a point where the internal pressure difference between the mud pumped in and the reservoir pressure was very low. However, with the relatively high volume of leakage that was passing through the BOP, the plan now included a try at blocking some of that leakage path by injecting debris (for which likely read rubber strips and small spheres) in the hope that these will lodge in the flow path within the BOP and reduce the leakage of fluid. The leakage rate is significant (I calculated earlier that it was around 17,000 bd, which lies within the newly reported range of 12,000 to 19,000 bd, and may have been higher than BP were actually anticipating. (Though the leak may also have increased a little as the mud was injected at higher pressures). The operation has already used all the mud on one of the supply boats, and has moved to the second (there is a third standing by so they won't run out). The concern, however is now with the volume of cement that will be required for the seal. The high volume that is leaking would require that additional amount to the volume needed for the seal itself, and that may be closer to the available capacity of the system that they have in place, or the supplies that they have on site to achieve the seal. 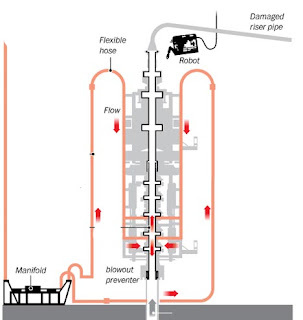 If that is the case, one can understand the desire to at least partially plug the leaks in the BOP, and to wait until the mud column fully balances the pressure in the oil reservoir before starting this phase of the operation. Until this point in the operation the volume of cement required to create an effective plug has not been seen as an issue. Now they have to get relatively large particles (larger than the smallest diameter of the flow path) through the feed lines, which have a size of 3-inches, and those of us who pump particles in fluids much prefer that the particle diameter be no more than 30% of the pipe diameter - which is to say in this case an inch. And so if the orifice in the BOP is larger than that, then there is a problem in working out how to get something in there that will be effective, remembering that it has to work through all the flow convolutions of the supply line that has just been installed for the mud. i heard a guy from deepwater horizon crew interviewed on radio say just before the blowout the pressure was measured at 1400 psi. he seemed to be saying that's high. is it? i would think even the water pressure at that depth must be over 2000.
is spp what i want? looks like it was in that range, between 1k & 1.5k, just before it shot off the chart. I am not familiar with that display, but "spp" may mean Stroke Pump Pressure -- peak pressure at the outlet of the positive displacement pump on the rig. Beware of reported pressures! The significance depends on where in the system the pressure is measured, and what else is going on in the system (like pumping). Related question -- a well full of mud ought to be totally safe. Bottom hole pressure at 18,000 feet with mud twice as dense as water would be over 15,000 psi, which is substantially higher than the 13,000 psi formation pressure reported by Tudor Pickering Holt & Co on their Macondo Blowout Conference call earlier this month. Even if the mud column is open to the sea floor, bottom hole pressure from 5,000 ft of seawater and 13,000 ft of mud (in the wellbore) would still be over 13,000 psi. The well should be static if it is full of mud, unless there are problems such as mud not getting into a flowpath in the annulus on the outside of the 9 7/8 by 7 inch tapered liner. The story is not over yet.